The theme for our 2018 School Psychology Awareness Week is "Unlock Potential. Find Your Password!" Unlock Potential. Find Your Password! During the week of November 12–16, 2018 schools throughout the country will celebrate National School Psychology Awareness Week to highlight the important work school psychologists and other educators do to help all students thrive. This year's theme is "Unlock Potential. Find Your Password!" A password is a personal key for unlocking any number of areas of potential in our lives. 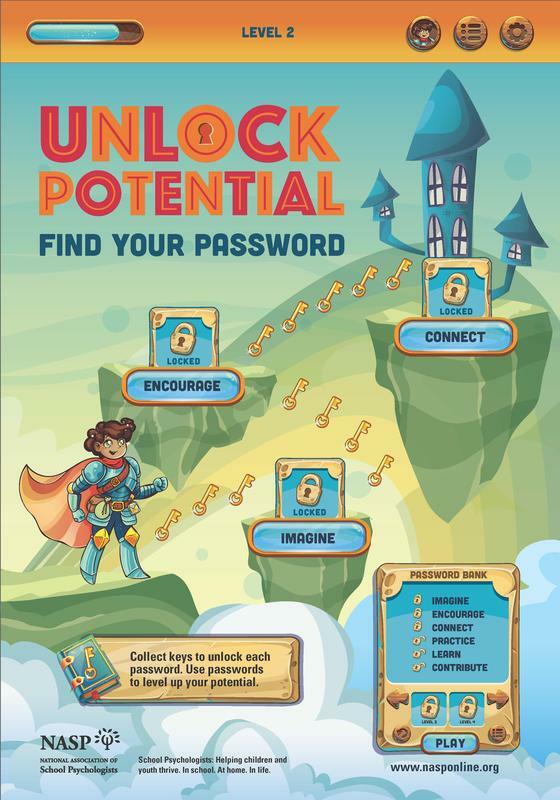 Our goal is to connect with how modern youth and adults unlock things (e.g., gaming levels, phones, devices, codes) and to highlight how thinking about specific skills, assets, or characteristics as "passwords" can lead to positive growth. School psychologists are particularly skilled at assisting students and staff in unlocking the resources, proactive and preventive skills, and positive connections necessary to unlock one's full potential to thrive in school and life. A password can help us set goals, identify action steps, communicated need, and engage in discussions to help create the connections necessary for students to develop critical academic and social emotional skills. Resources and messaging can be adapted to students and adults, different age groups and multiple contexts. The poster image reflects a magical game world in which the main character strives to find passwords to level up their potential. The program involves a series of resources and suggested activities to help the school staff, students and parents use the theme to convey the variety of factors that contribute to thriving students and school communities. From sample newsletters, to interactive classroom activities, to press releases, there are multiple ways to bring the "Unlock Potential. Find Your Password!" theme to your local community. Be sure to share your event with us through the SPAW feedback survey and tweet with the #unlockpotential hashtag.